Road Trips are exciting! 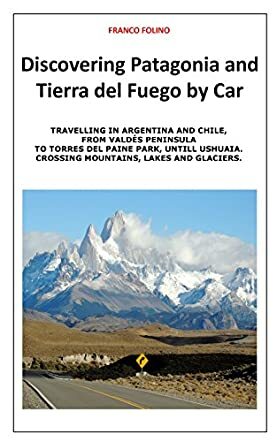 Discovering Patagonia and Tierra Del Fuego by Car: Crossing Mountains, Lakes and Glaciers (Travelling South America by Car Book 2) by Franco Folino is an engaging travel book that introduces readers to desolate and wild landscapes, spectacular scenery, and stunning mountains. The author speaks about the varied fauna and flora of the place, the local population, and the true character of the inhabitants. The book gives an idea of what to expect in Patagonia while traveling to this region, and also useful tips on how to organize your trip. The author takes you to the soul of the place and will help you understand the atmosphere of this remote part of the world, experience the sensations it offers, and keep the adrenaline flowing while you are there. The author makes sure that readers get in touch with the environment around them and they get the feeling of having their dreams becoming more and more concrete as the time of departure to Patagonia approaches. The book gives the must-see places and how to plan the trips to nearby spots. The author handles the topic extensively with clarity and precision, making it easy to readers to use the book as a travel guide if they are planning a trip to Patagonia. The sights and sounds of the places and the beautiful photographs capture the stunning landscapes. The hiking, trekking, climbing, traveling, and exploring mentioned in the book are enough to make anyone put on their travel boots and go to Patagonia and the places around it.